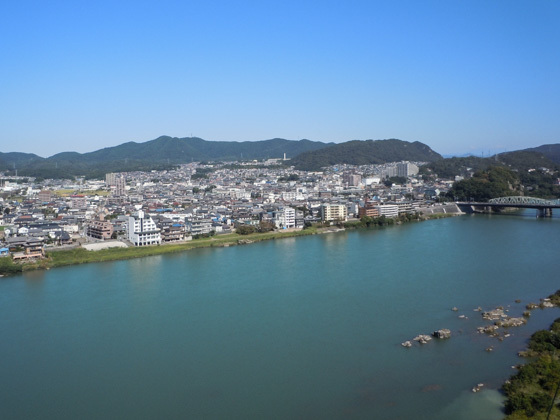 If you are interested in our Inuyama guided tour, please contact us from this page. 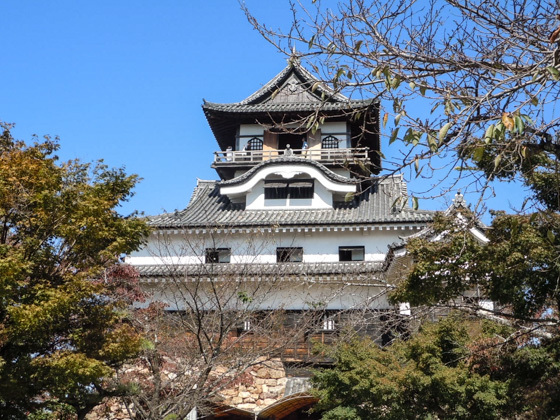 The castle was built in 1537 by Oda Nobuyasu, the uncle of the famous warrior Oda Nobunaga. It boasts of having the oldest existing castle tower. The castle has three layers in the exterior, four stories inside, and two basement stories, while the upper floor of the castle tower serves as a watch tower. 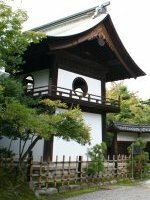 Since Inuyama Castle was constructed as a guarding tower during the war, it maintains a simple and robust style. Walk through the castle gate, and you will find the castle tower standing right in front! A perfect place to take a picture with the castle as a background. Staff will offer you to take photos. They know the best shooting angle, so why not take the opportunity? 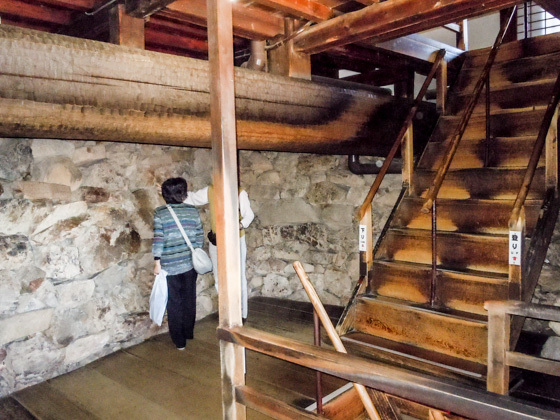 On the east side of the castle tower used to stand a cedar tree which was higher than the Inuyama Castle. Unfortunately, it died from a lightning strike during the Isewan Typhoon (also known as Typhoon Vera) in 1959. 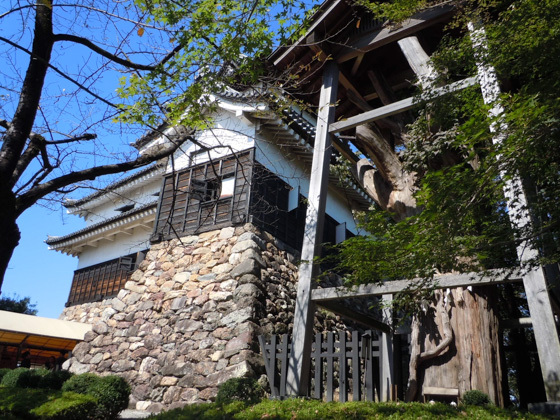 The local people believe that the tree protected the castle from being hit and therefore enshrine it. The stonewall is formed by piling up fieldstones. 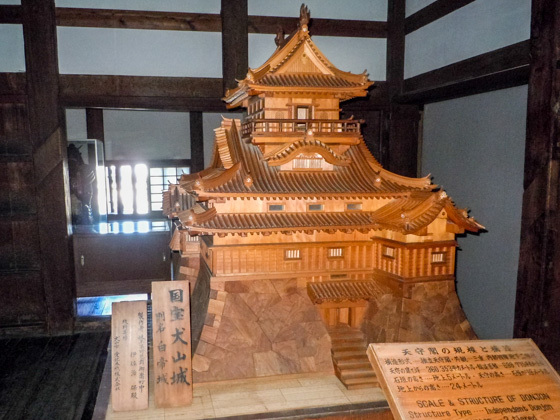 Wooden materials used from the initial construction stage of the castle still remains. You will also find steep staircases inside the castle. The corridor makes a squeaking sound to let others know that the enemies have come in. Use your five senses to feel and imagine the history. 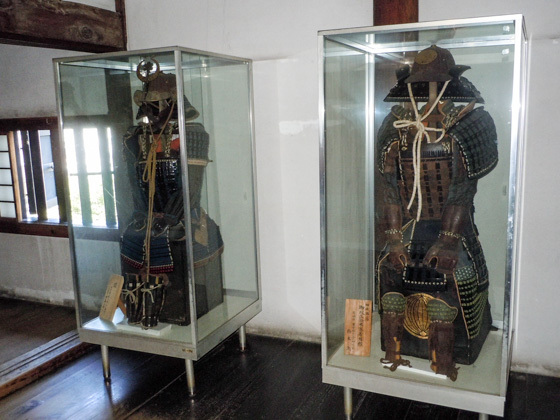 Warrior armors such as the Yoroi and Kabuto, and Onigawara (roof ornamentation) and the Byobu folding screens are exhibited on the first floor. 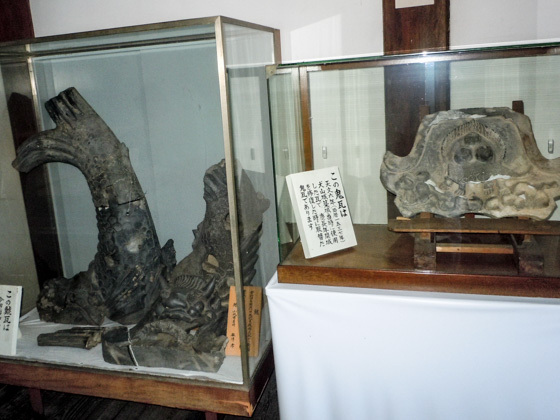 The entire set of the Yoroi and Kabuto weighs 20 kilograms. On the top floor of the castle tower, there is a corridor to observe the landscape. The skyscrapers near Nagoya station can be seen on a fine day when the sky is clear. After exploring the castle, it's time to have a short break with some soft ice cream. 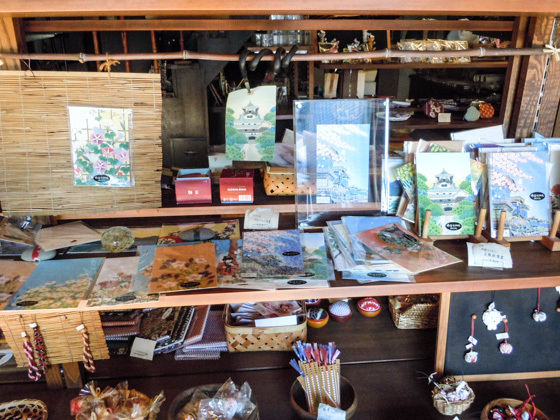 Local souvenirs of Inuyama are also available at the shop. 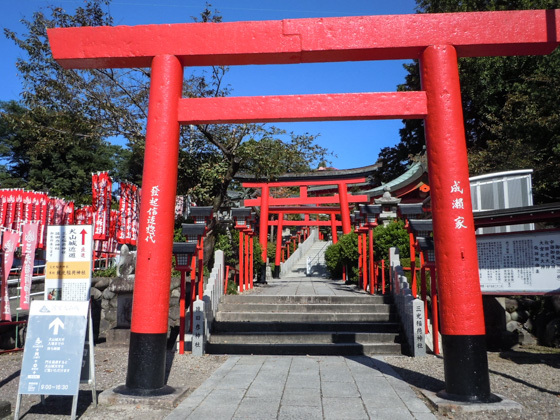 The bright vermillion colored Torii shrine arch awaits you at the Sanko-inari Jinja Shrine near the castle. 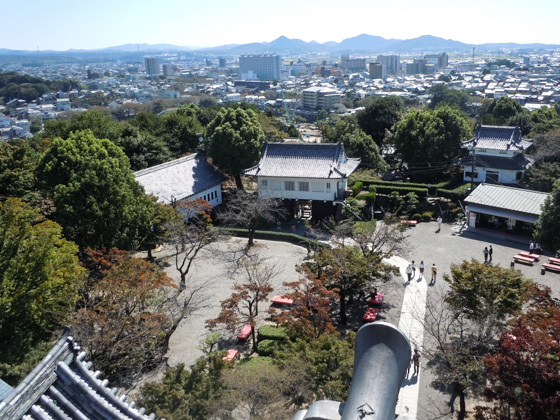 Climb up the slope to get to the Inuyama Castle. 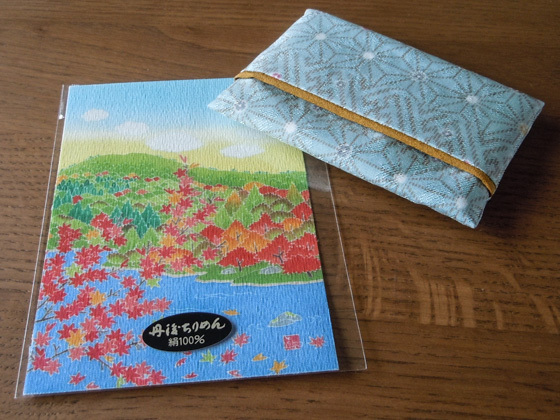 It is believed that your wishes will come true by writing down your wish on the Ema wooden plaque. 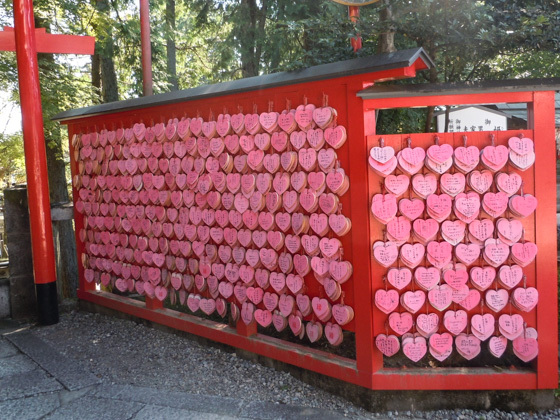 At this shrine, you will see a number of heart-shaped Ema which is for writing down wishes related to your love relationship. 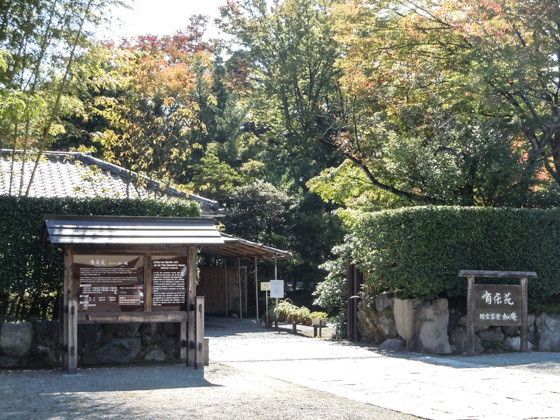 This shrine is also in a close distance from the castle. 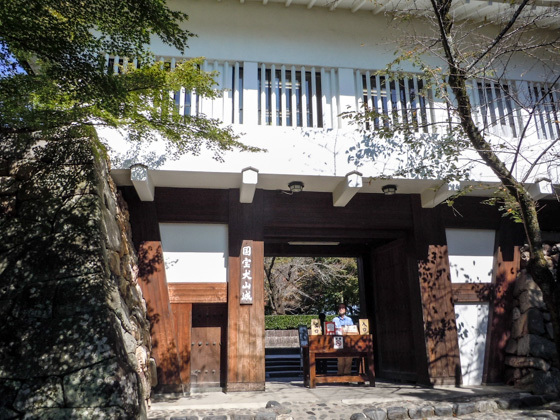 It has a different atmosphere from the Sanko-inari shrine. 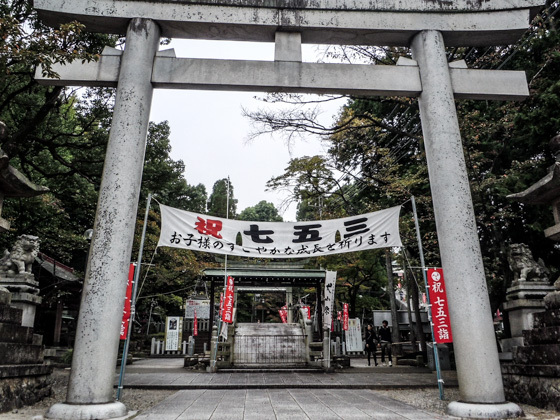 The Inuyama Matsuri Festival (held on the first Saturday of April every year), which is one of Japan's important intangible cultural assets, is held in Haritsuna Shrine. The festival is gorgeous and elegant with 13 Yama (festival floats) performing. 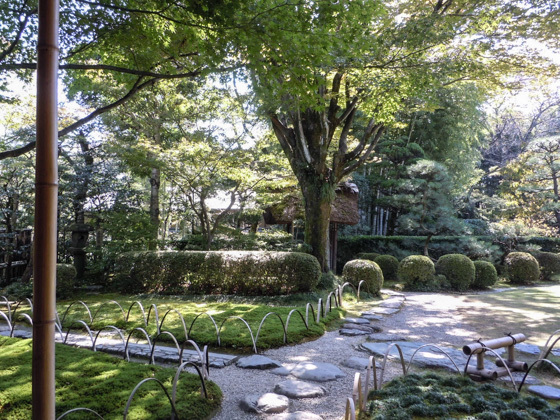 Joan is the only national treasure teahouse which is open to public at ordinary times. 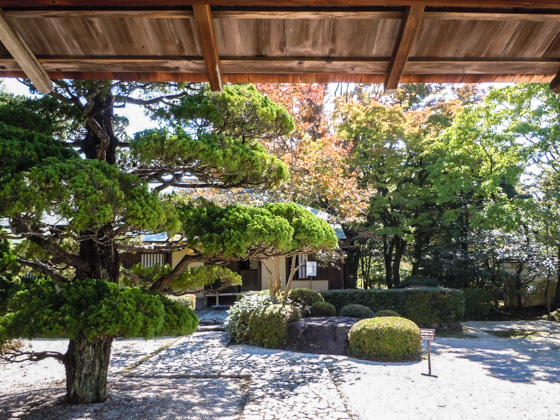 Garden view from the former Shoden-in Shoin. 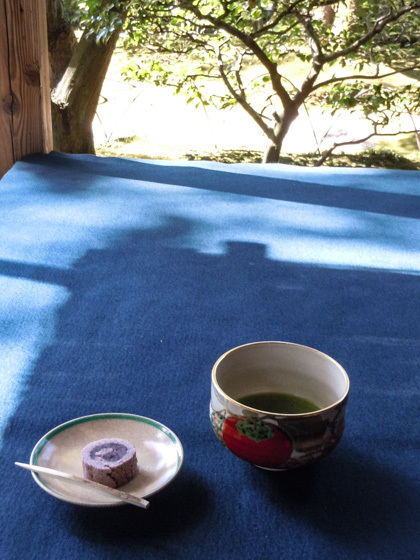 Tea served at the former Shoden-in Shoin (600 yen). Maccha tea and an elegant Japanese sweet are served in a tea set made in Inuyama. Enjoy them together with a fine view of the garden. The Suikin-kutsu (garden ornament) at Uraku-en. 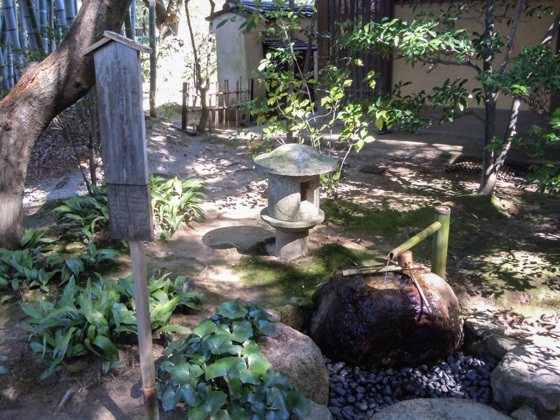 Suikin-kutsu is a buried earthen jar that makes sound when water drips into it. Have a quiet and peaceful moment surrounded by nature. 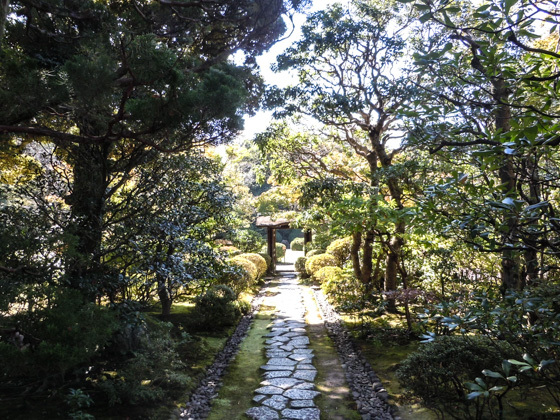 Enjoy the Shishi-odoshi and Suikin-kutsu ornaments which you can find only in Japanese gardens. In late November, the tree leaves turn into red, making the garden even more attractive. 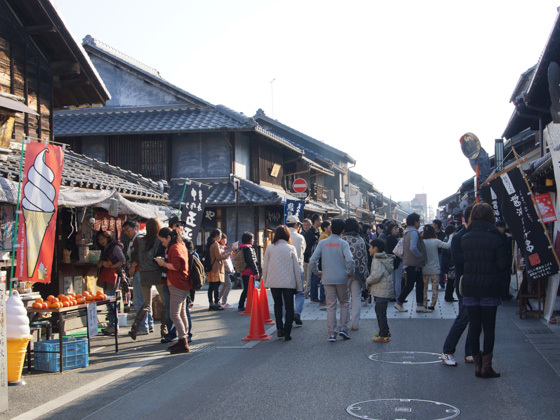 The castle town of Inuyama has been preserved and replicated to show the old traditional townscape. 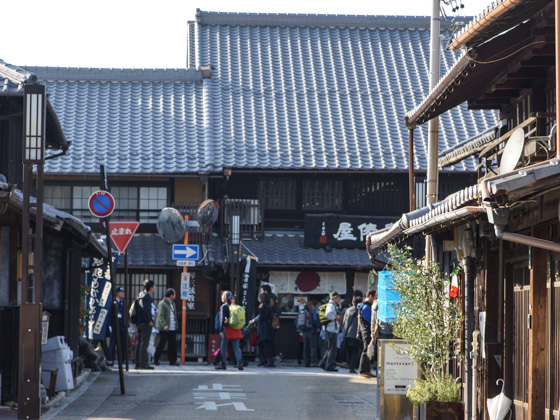 Various museums, souvenir shops, Japanese confectionery shops and restaurants stand along the street. The festival floats that are used in the Inuyama Matsuri Festival have a triple layer structure. The Karakuri mechanical dolls are attached to the top layer. 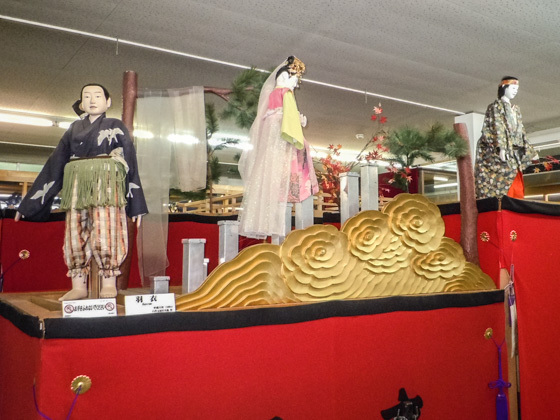 Karakuri dolls are displayed in the hall, and shows are held regularly between 10:30 a.m. and 2:00 p.m. on Saturdays, Sundays and public holidays. 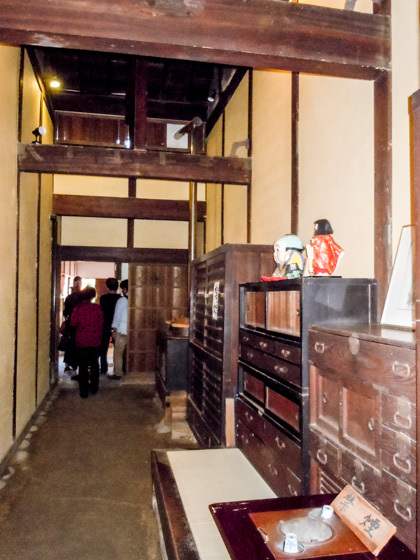 The former Isobe's House, a registered tangible cultural asset, is a wooden architecture house of the Edo period. The Edo government imposed tax according to the space of building entrance. 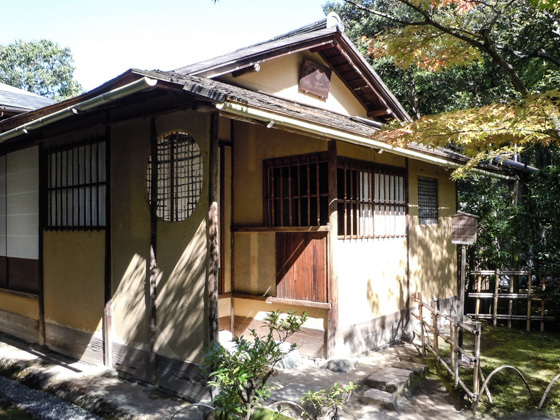 Thus, the house has a narrow entrance, but extends largely as you go in. 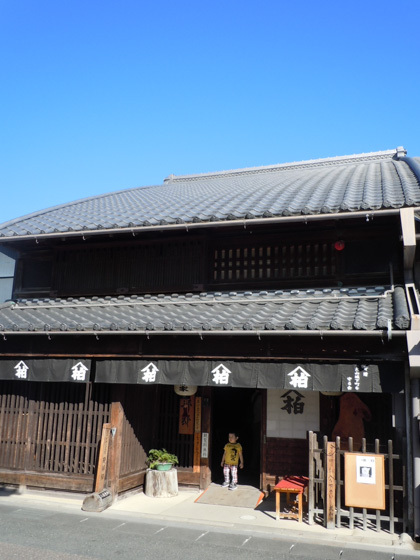 Former Isobe's House is considered valuable, as it is the only existing Machiya house in Inuyama city with the Mukuri Yane (a slightly curved roof). 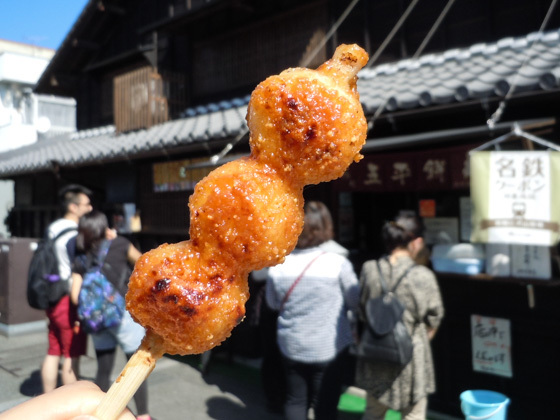 Kushi-mono (skewered food) is the specialty of the town surrounding Inuyama Castle. 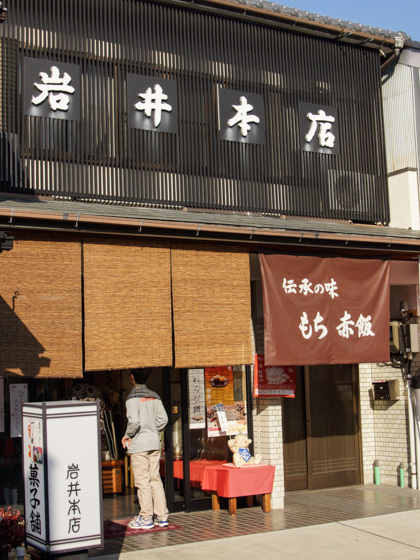 Over 40 shops offer various Kushi-mono (Kushi-katsu, Dango, and more). 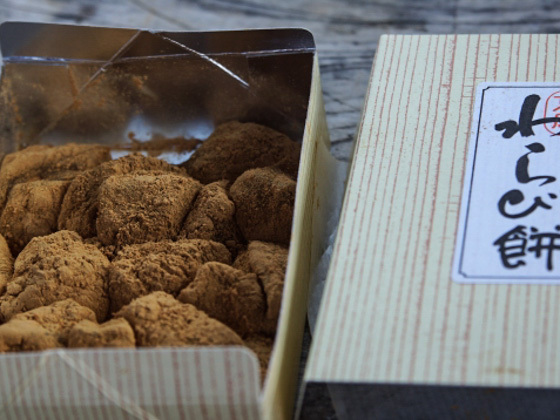 Walking along the street with a Kushi in your hand is one way to enjoy your trip. 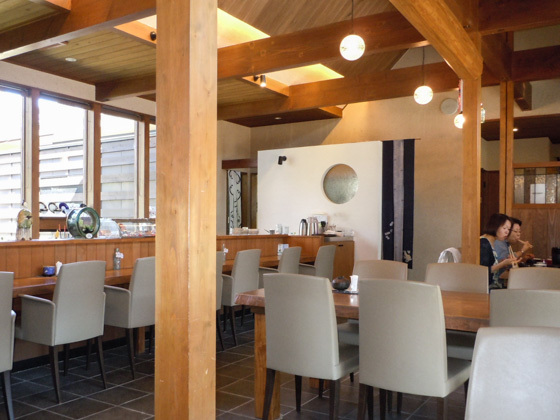 "Yamada Gohei-mochi-ten" serves only handmade food. 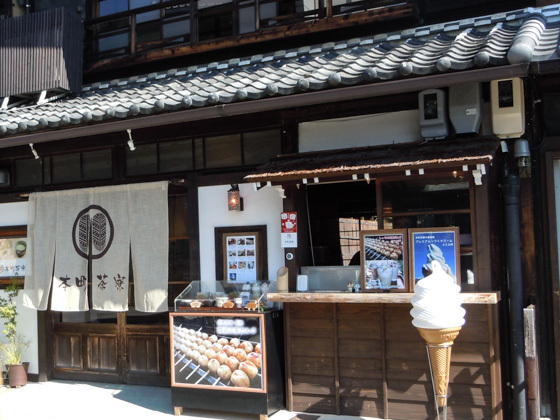 You will see many tourists eating Yamada's Gohei-mochi (100 yen per stick). 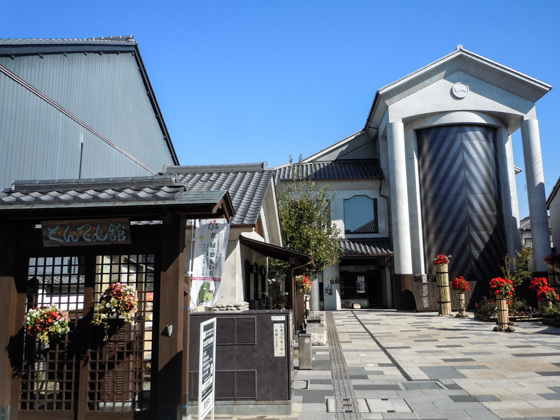 At "Motomachi Saryo" we recommend the Shoyu-genmai Dango (100 yen per stick) and the Mini Dengaku Teishoku set (650 yen) which is an eat-in menu to satisfy your stomach. Would like to try sweets using fresh fruits? 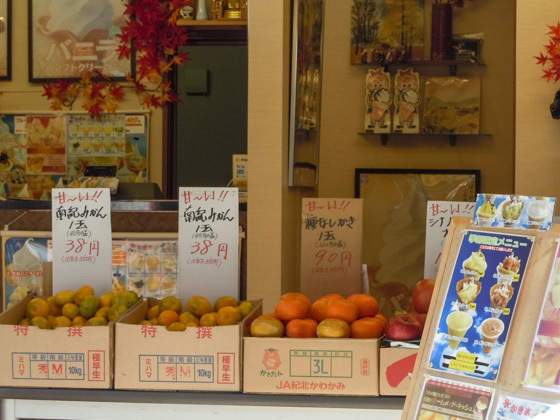 Drop in at "Yoshikawa-ya" a local fruit shop. 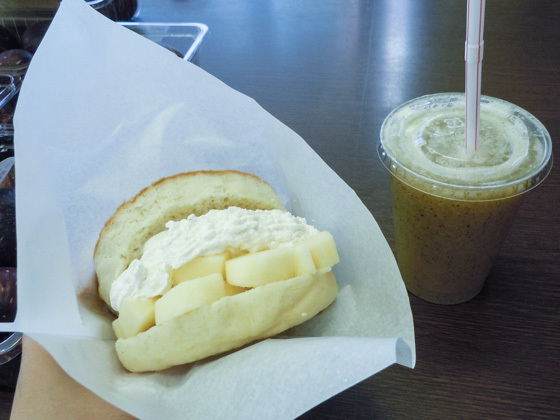 Fresh kiwi juice (350 yen) and pancake apple sandwich (250 yen). 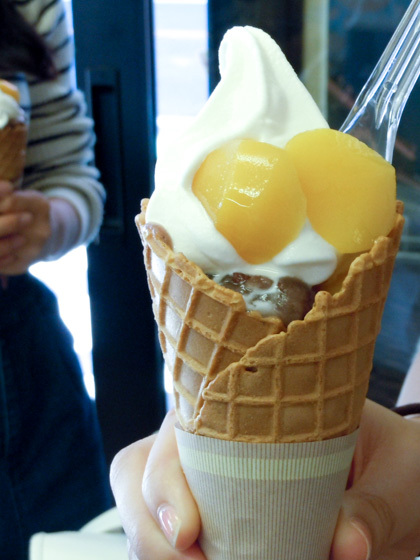 Soft ice cream and parfait using fruits of the season are also popular. Picture shows a chestnut soft ice cream. 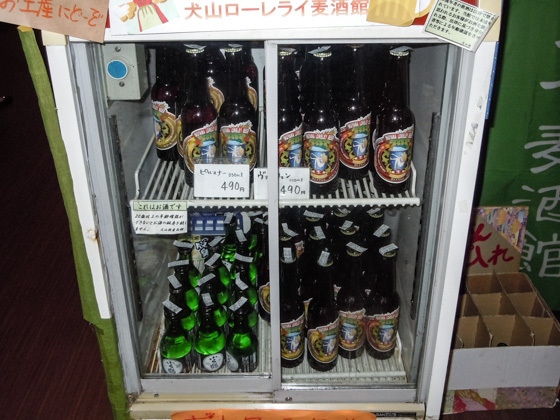 Craft beer "Loreley beer" brewed following the German method. Available at the Tokusan-hinkan. A modern Japanese style café. Recommended for those who would like to spend time to eat in a relaxed mood. A big healthy lunch using delicious Tofu from the traditional Tofu shop. 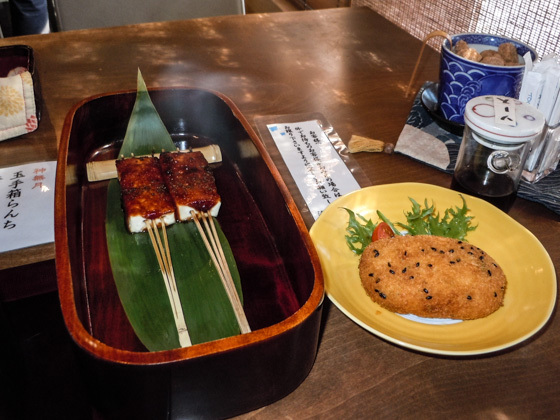 Picture indicates Inuyama's famous Dengaku, Yuba, and Tofu croquette. 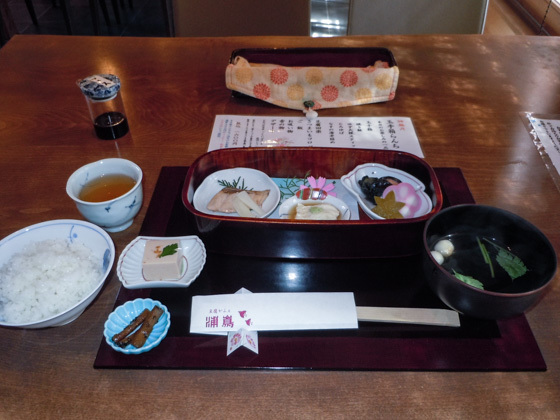 The Tamate-bako lunch set is the only menu served during lunch. Available at a limited quantity. Dishes change according to the season. Kyoto's Tango Chirimen silk textile and other Chirimen silk products are sold here. 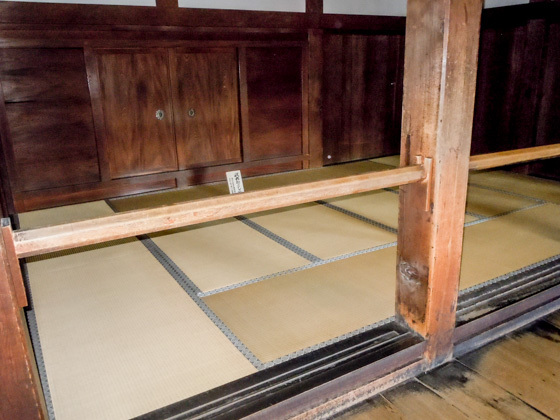 The shop owner is originally from a Kyoto Tango Chirimen silk textile manufacturer. 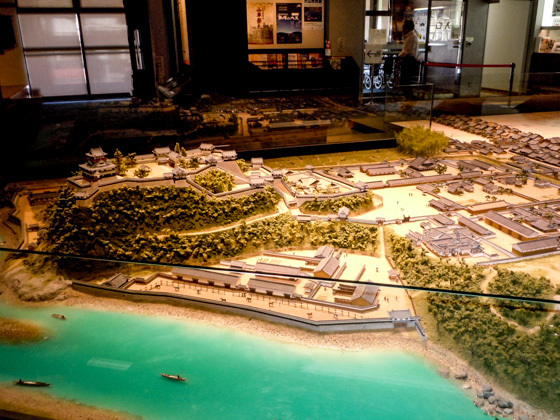 Inuyama has a history of being one of the major manufacturing cities of Japanese sweets. From fine high-class traditional Japanese confectionery used for tea ceremonies, up to sweet snacks for children, a wide variety of sweets are available. 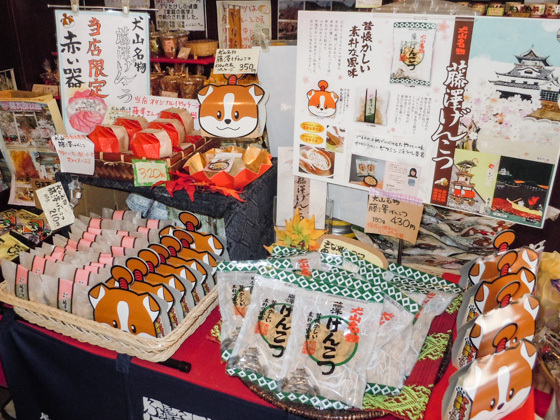 The "Genkotsu" candies made of natural healthy ingredients such as Kinako (roasted soybean flour), brown sugar, and sesame are Inuyama's hundred century-long specialty. Genkotsu literally means a fisted hand. Both hard and soft type candies are available. 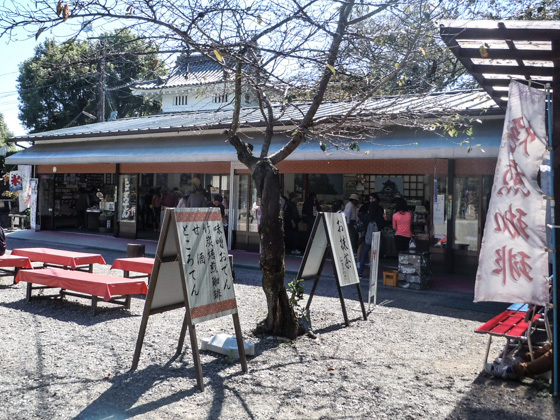 Tea ceremony is popular in Inuyama. That is why you see a lot of stores selling Japanese confectionery to match with the tea. 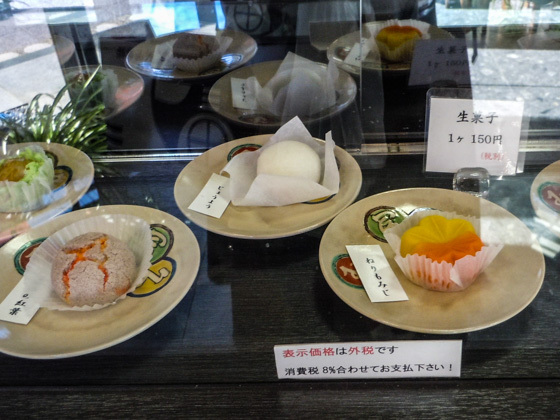 Picture shows the colorful sweets sold at "Tamafuku"
Iwai Honten sells Mochi and Dango sweets. Their Warabi-mochi is awesome!